1. What progress has been made? China has agreed in principle to increase imports of U.S. agricultural products, along with energy, industrial products and services, as part of a path to eliminate its imbalance in trade with the U.S. That promise might form the basis of a preliminary agreement. Treasury Secretary Steven Mnuchin said in April that the U.S. and China were “hopefully getting very close to the final round” One option on the table is for China to shift some punitive tariffs on agricultural goods that it imposed in 2018 to other products, helping Trump to sell any eventual trade deal to farmers ahead of the 2020 election. 2. What are the sticking points? The two sides are said to remain far apart on U.S. demands for structural change to the heavy involvement of the state in China’s economy. Protection of intellectual property is another prime U.S. concern. China in March passed a new foreign investment law it said would deal with some of those issues. Trump says he wants “strong enforcement language’’ in any deal, yet his aides are still figuring out what that should be -- and how to get China to sign off. Officials in Beijing are said to be pushing for the U.S. to remove tariffs on Chinese goods. It’s tough to see what the Chinese side will agree to beyond promises to buy more U.S. goods, given that it denies allegations of misbehavior that include forcing foreign companies to hand over their technology. The widening U.S. government crackdown on Huawei Technologies Co., a Chinese telecommunications giant, underscores a deepening strategic competition that will persist beyond the trade war. 3. What would escalation entail? If Trump walks, he could go forward with the higher 25 percent tariffs and other restrictions on Chinese investment in the U.S.; China could reply with more countermeasures, such as diverting its purchases away from the U.S. That could prompt Trump to follow through on threats to slap duties on a further $267 billion of goods. The risk of economic damage on both sides -- plus political damage to Trump in the 2020 election -- might make one or both sides reluctant to escalate. 4. Why are we in a trade war? Trump points to the large U.S. trade deficit, the difference between imports and exports, as a symbol of a declining manufacturing base and the loss of American might. But the fight is also about who gets to set the rules for the global economy of the future. That’s why technology is at the heart of the dispute, as evidenced by U.S. concerns about Huawei. 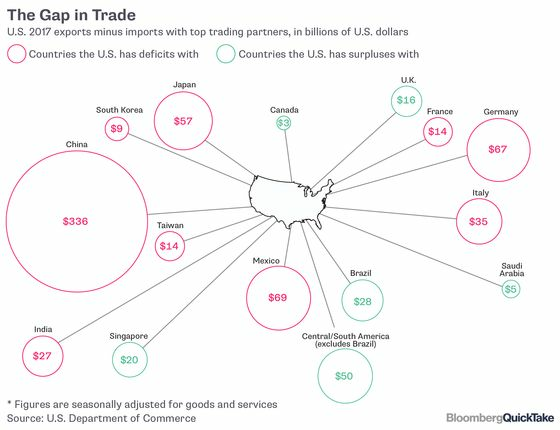 Trump aims to reduce the trade gap by both browbeating and enticing U.S. companies to import less and export more. In addition to goods from China, he’s imposed tariffs (which act like a tax on imports) on steel and aluminum from allies including Canada, Mexico and the European Union. 5. What’s been the impact of the trade war? Investors and executives routinely say it’s hurt business confidence and upended supply chains. Apple, Starbucks, Volkswagen and FedEx are among companies that cited a slowing Chinese economy in their outlooks. More than 400 publicly traded Chinese companies warned on their earnings. The IMF, cutting its forecast for the world economy for the third time in six months due in part to trade tensions, said on April 9 that global growth would be 3.3 percent in 2019, which would be the weakest since 2009. Meanwhile the U.S. trade deficit widened in 2018 to a 10-year high of $621 billion, partly because the stronger dollar made U.S. exports pricier. 6. How has the conflict been felt in the U.S.? American shoppers have been mostly insulated, because inflation remains tame and the tariffs haven’t hit staples such as clothing, footwear and toys. That could change. A January report by Bank of America Corp. analysts said any escalation of the trade war “would be much more painful” for the U.S., triggering renewed market volatility and undermining investor confidence. 7. How has it been felt in China? China’s economic growth has been slowing in recent years, a weakness that U.S. officials sought to leverage in their push for a trade agreement. But China’s economy rebounded through the first quarter of 2019, offering the government more room for maneuver. Authorities in Beijing have already promised almost $300 billion of tax cuts to stoke growth, and are said to be considering other stimulus measures to bolster sales of cars and appliances. Bloomberg Economics estimates China would avoid a 0.3 percent drag on 2019 gross domestic product if the trade truce holds. Their base case -- assuming an escalation is avoided -- is for economic growth in China to slow to 6.2 percent in 2019, down from 6.6 percent in 2018. 8. Where is this going? Chinese and U.S. negotiators have been working line-by-line through the text of an agreement that can be put before Trump and Xi, according to officials familiar with the matter. There’s been a lot of talk about a summit between the two leaders at some point. Trump will want a deal that boosts the stock market, and to declare victory, but Xi will not want to be portrayed as having surrendered. As tensions ease with China, they are starting to simmer against Europe and Japan. QuickTakes on China’s slowdown, its new investment law and the intellectual-property dispute. A McKinsey report argues the U.S. is winning globalization’s next wave. The Center for Strategic and International Studies looks at a potential path from truce to lasting deal. China keeps gorging on California pistachios.